Yes, it’s that time of year when people make New Year Resolutions. As they are usually to do with health, you might be surprised that whether you have made one or not, is not important to me. Why? Because I know that most people who set one, break it before the end of the month. They are often based on what other people think we should do. Though they might help us reach a set goal, they are laden with rules, regulations and often everything but fun! I don’t have a New Year resolution, but if you want to take steps to a better life, here is an idea of what you could do. What is important to me, is to take time to become clear about what our values are. Then it becomes clear what steps to take to live by them. If one of your top three values is health, like mine is, then when you are making decisions about what to eat or what to do, for example, you have clarity as to whether it will serve you and therefore live congruently. I have my values that I live by. We all have different combinations of them and a short version of what mine are, look something like this. 4) When I do them it is fun, enjoyable and I feel good. I have found something that fits all these criteria, which is why I love it so much. 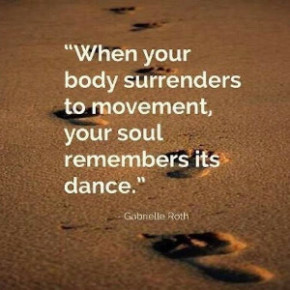 It is a form of mindful movement meditation called ‘5 Rhythms‘ developed by Gabrielle Roth. You have fun and can be just who and how you are, not withstanding the fact it is good for your physical, mental and emotional health. Suitable for everyone! Whatever your level of fitness or unfitness, wellness or illness. No experience of any form of exercise required. All you need is to wear loose comfortable clothes, layers to remove as you warm up & put back on as you cool down and bring some water. So, if you haven’t got a New Year resolution and still feel you need one, or decide you would like to change it, can I suggest you commit to attending one of the 5 Rhythms sessions held in Liddington or elsewhere in the country if you are not near Swindon, to find out if it is for you. Here are the details of the first 2 if you would like to join me and I wish you a happy healthy 2018. Dancing the ‘5rhythms’ is a beautiful exploration of our ability to be conscious of how we are in any one moment and to express this through movement. Booking is essential to avoid disappointment as places are limited to 16. Booking: Each event has a booking form you can fill out and you will receive an automatic email with payment details. Feel the joy of a flowing life.